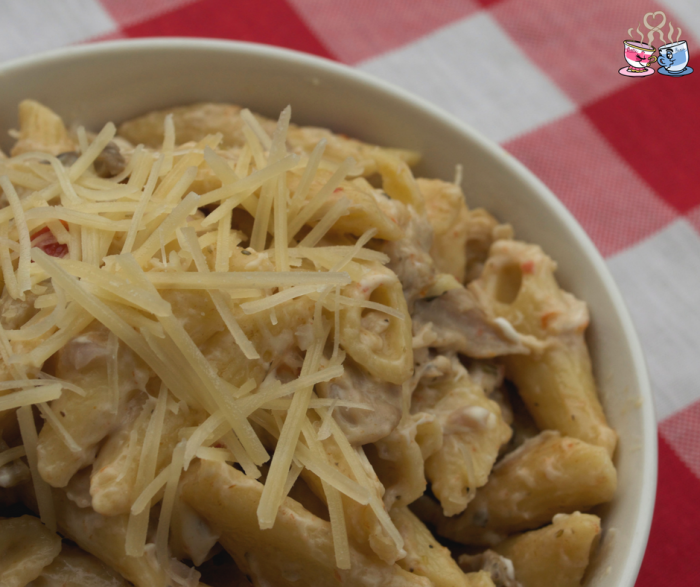 This Instant Pot Italian Creamy Chicken Pasta Recipe is a wonderful meal that your whole family is going to love. 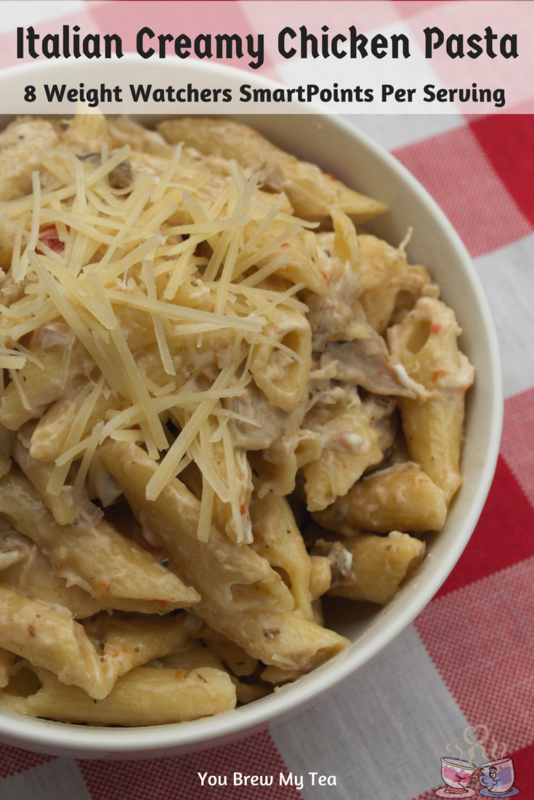 Easy, affordable, and delicious – this was a hit when Emilee made it for her family! Since I am no longer eating meat, she has been helping me create great Weight Watchers recipes for you, and this is one of her latest! One of my favorite things to make has always been a simple pasta dish. Just because you are eating healthier and following Weight Watchers SmartPoints plan doesn’t mean you can’t enjoy pasta. This recipe shows you just how delicious you can make mealtime while still staying within your points plan! Plus, this is an excellent Instant Pot recipe to impress anyone who wonders if an Instant Pot is a good investment. I love my Instant Pot Duo60. Add all ingredients to Instant Pot liner, except for cheeses. Place lid and set to seal. Set to high pressure (manual) for 9 minutes. Once done, allow to NPR (natural pressure release) for 5 minutes. Once pressure has released, remove the lid and stir in cheeses until well combined and melted. Serve with additional Parmesan or parsley as desired. Mix well so that pasta is covered in liquid and everything is well combined. This could also be cooked easily on the stove top if you prefer. To cook on the stove top, you would need to cook the pasta on the stove top according to package directions. Next, you would add a bit of oil to a large stockpot, cook the vegetables and chicken until done, then combine with already cooked pasta and cheese. 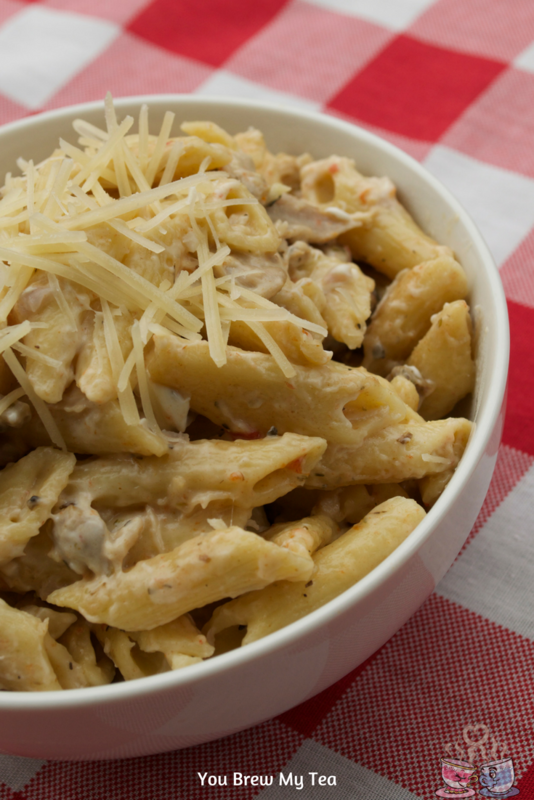 This easy Instant Pot Italian Creamy Chicken Pasta is a great meal that is super kid-friendly. Make this and portion out for your lunches to stay on track with your Weight Watchers diet plan, or divide up and enjoy a family meal that everyone loves. Pasta is a great easy meal that can add to your meal plan with just a few minutes prep work! Yes, please! This recipe looks super yummy! I love the sound of weight watchers in this post. This goes to show you can still eat yummy food, but you just need to portion it out. Thank you for sharing! I haven’t had pasta in a while and this got me craving! Looks absolutely yummy! Thanks for sharing at Fiesta Friday party! This is a great time of year to watch those calories! Your paste looks super creamy and delicious! Thank you for bringing it to Fiesta Friday! Happy Fiesta Friday! This looks like a great recipe that is quick and delicious! Thanks so much for sharing your special post with us at Full Plate Thursday this week. Hope you have a great week and come back to see us real soon! Is the chicken cooked or raw when you put it in the instant pot? The chicken is raw when placed in the Instant Pot. Can you use frozen chicken? If so, how much longer should I cook it? You can use frozen. I would add an additional 5 minutes for frozen. I tried this recipe tonight and it was fantastic; however, I put all the ingredients in to the WW recipe builder and it came out to 8SP using Freestyle. Any thoughts? Was there a specific lower SP pasta you used? Is the pasta totally covered with the chicken broth? and what size Instant Pot were you using? It would depend on the type of pasta you use, but it will be covered with ingredients. I use a 6 quart IP. Tried this tonight and had to add 3 cups of water in order for the pasta to be covered. The chicken and pasta were terribly over cooked. I used a 6 qt. IP and there definitely was a lot of pasta, but it was not delicious. I want this recipe to work, but I don’t know how to fix it. Perhaps the instructions are not clear for you. You are to use 2 cups water and make sure it is well mixed. You don’t need it to be covered, just wet/coated in the water/broth. I have made this several times and we enjoyed it. Perhaps it just isn’t a flavor profile your family enjoys? Do you think I can seat the chicks some before cooking all together? If you wanted to sear them that would be fine. Usually not enough liquid is an indicator if it burns. Perhaps add a bit of extra liquid first then mix and add remaining? When you say “Italian seasonings,” are you talking about like a dressing packet, a spice bottle of Italian seasonings, Italian salt, etc.? I JUST got my pot delivered and I want this soooo bad! Made this tonight following the directions carefully as I’m new to the pressure cooker but my noodles didn’t fully cook. I used whole wheat pasta though, maybe that’s why? Just stirred it up & set it for an additional 5 min, hoping that works as it smells amazing! This doesn’t specify if the cubed chicken is cooked or raw. Which is it? My pasta wasn’t either done enough or too done, even after not adding the whole 16 oz of pasta. I will add more chicken broth and more seasoning next time. Will give it a second try. Can this be cooked in a slow cooker? If so what would you do differently? So the diced roma tomatoes go into to pot? They aren’t just a garnish for the finished product? Made this tonight and followed the directions EXACTLY. The bottom burned, some of the past is done some is not. I am now trying to salvage dinner(and my Instant Pot insert). I am sorry you had a bad experience with this recipe. We’ve made this several times with no issues. I just put this in the WW app and it came out to 4 sp. I feel like I’m missing something. Currently, we aren’t providing this, but we will take it under consideration. Tried making this pasta. It did taste delicious, but there was a lot of liquid left in the pot. Is the sauce supposed to be thick? The sauce should be thicker. Some elevations require less liquid than others. I am sorry it didn’t turn out as expected! I’ve never used my IP. Do I need to adjust this recipe in any way of mine is an 8qt?